Teens and twenty-somethings stand at the top of life's long road. The road of life is full of unexpected turns and detours. Young people, like anyone on a journey, can benefit from a guide, someone who has been down that road before, to help them navigate the ups and downs, twists and turns of life. Ken Lawrence is a life coach and motivational speaker with a passion for helping today's youth successfully navigate their life's journey. His mission is to equip, enthuse and empower young people by giving them the tools and life skills necessary to succeed. Let Ken help guide your youth on the road to success. The key to being a business survivor is having strong leadership and a well established plan. Ken Lawrence is a John Maxwell certified leadership coach with over 15 years of management experience. Let Ken equip you to be the strongest leader you can be so your company doesn't just survive, it thrives! Ken is an international speaker gifted in making complex topics understandable and interesting. His personable and engaging style sets audiences at ease and ready to learn. Through his engaging talks Ken has equipped, enthused and empowered audiences ranging from middle school students to engineering groups and organizational leaders. Click here to book Ken to speak to your group today. Bullying, failure, low self-image, and poor character decisions are at the heart of many of the challenges facing young people today. John Maxwell and Ken Lawrence have decided to do something about it. As a certified John Maxwell Team speaker Ken Lawrence is offering YouthMAX, a youth leadership curriculum, designed to give today’s young people practical tools and ideas to help them navigate life. Ken would love to bring the YouthMAX training into your community to help youth grow and develop to meet the challenges of life in today's changing world. There are four sessions in the YouthMAX curriculum. They can be presented individually over one class period or together as a half day seminar. They can be presented in any order. Session 1 - Stand Up and Be Counted - Learn positive attitudes and actions that will help stop bullying and lift others up. Stand Up - Be confident in your own value. Pick Up - Help others who are being bullied by picking them up. Session 2 - Developing a Positive Self-Image - Understand and apply key ways to develop and maintain a positive self-image. Developing a Positive Self-Image teaches youth that we all are unique and have high value to others. With this in mind we can build personal confidence and develop daily habits that will help youth maintain a positive self-image. Session 3 - Developing Strong Personal Character - Learn what it takes to develop strong and effective personal character. According to John Maxwell, character is the number one differentiator between shooting stars and people who obtain and maintain life-long success. His lesson Developing Strong Personal Character teaches youth how to choose positive, character-based daily decisions that will help bring their actions and values in line and help them learn to achieve lasting personal success. Session 4 - Learning to Fail Forward to Success - Learn powerful, proven ways to look at failure in a new way and use life’s failures to build success. John Maxwell's lesson, Learning to Fail Forward to Success, teaches that failure is the foundation for all success. This lesson helps youth understand how to learn from failure, change, and grow toward success. Click here to contact Ken Lawrence today to bring YouthMAX to your youth group. 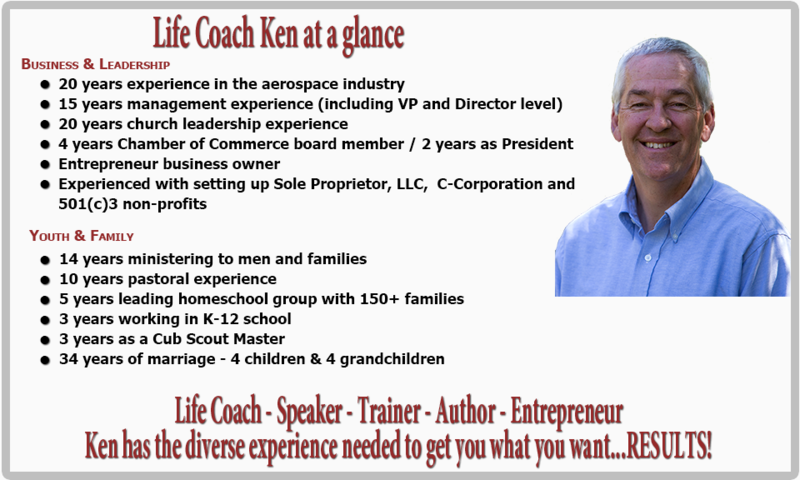 As a life coach Ken has a wealth of life experience that he can put to work for you. He is a life coach, motivational speaker, author and entrepreneur. Ken has been married to his wife Chris since 1981, is the father of four and grandfather of four. He has a passion for serving families and helping young people reach their full, God-given potential. Ken is the author of the book Cyber Influence - Life Lessons from Computers (working title) to be released in the fall of 2017. He is also the author of The Gold Panning System, a book that teaches people an easy, step-by-step method for studying the Bible, and numerous magazine and blog articles over the years. Ken has over 15 years of corporate management experience. He served as Vice President of Technical Services for a multi-million dollar corporation which grew from $3 million to $21 million in sales. 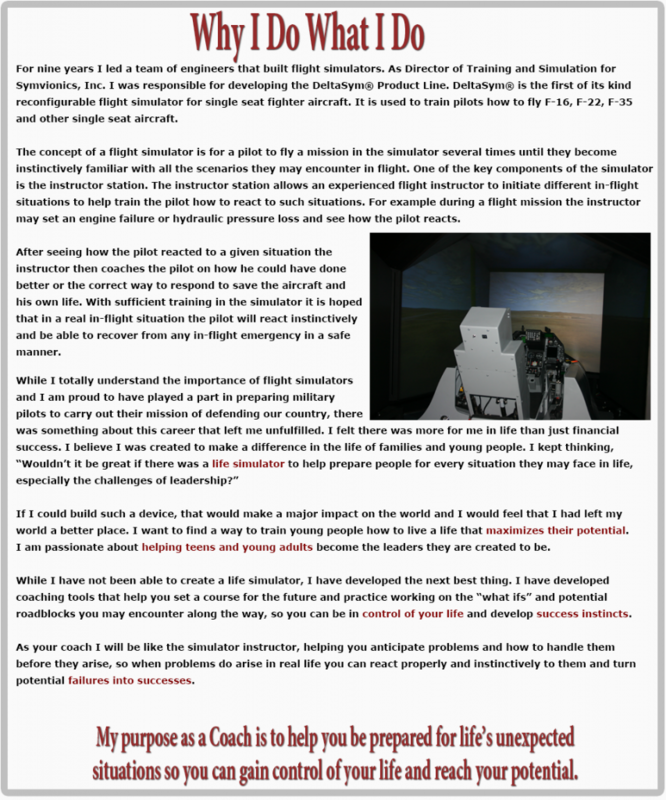 He was the Director of Training and Simulation Systems for another corporation where he managed program budgets of nearly $20 million. Ken understands the demands and challenges of corporate leadership, program management and personnel management. Ken is also community-minded having served on the board of the Norwood Chamber of Commerce for several years and president for two years. He was also a Cub Scout Master for three years and has worked with middle school and high school youth throughout his adult life. Ken is certified to teach 7th - 12th grade in Career and Technical Education by the Colorado Department of Education. Ken and his family live in beautiful Norwood, Colorado on a 35 acre retreat center. If you would like Ken to be your life coach or to speak at your event, you can reach him at (970) 551-0047. You can reach Ken by email at Succeed @ LifeCoachKen.com.